The presentation of mitral regurgitation varies and largely depends on its etiology, severity, and rate of onset. In acute severe mitral regurgitation, patients may present in heart failure or cardiogenic shock. In chronic mitral regurgitation, depending on the degree of regurgitation, patients may be asymptomatic and may remain so for many years. As the volume of regurgitation increases, the LV also increases in size. Progressive LV dilatation eventually leads to impaired contraction, increased afterload, reduced cardiac output, and, finally, left heart failure. Major factors in management of mitral regurgitation include determining when to start therapy and what type of intervention is needed. Prognosis in patients with mitral regurgitation varies with the timing of the presentation and the severity of the associated congenital defects. These four anatomic components function to allow unobstructed blood flow from the left atrium to the LV during diastole and to maintain competent closure during ventricular systole. The leaflets open fully during the early rapid-filling phase of diastole. They begin to close passively as LV pressure and volume increase. Then, the leaflets reopen briefly as atrial contraction occurs, adding additional volume to the LV. During atrial contraction, annular contraction begins, effectively decreasing the circumference of the mitral valve by 20%-30% throughout systole. Contraction of the papillary muscles serves to maintain the length of the chordae under the pressure that develops during systole. In the event that one or more of the four components is rendered nonfunctional or developmentally abnormal, mitral regurgitation (mitral valve insufficiency) results. Although the pathophysiology resulting from mitral regurgitation (MR) (mitral valve insufficiency) is similar throughout all age groups, the specific cause of mitral regurgitation differs with age. Normal blood flow from the left atrium to the left ventricle (LV) and, subsequently, to the systemic circulation, is altered in mitral regurgitation. In the presence of mitral regurgitation, as the blood flows antegrade from the LV into the aorta, and the regurgitant volume flows retrograde from the LV into the left atrium, this causes a proportionate increase in LV ejection volume. The regurgitant fraction reenters the LV, producing LV volume overload. 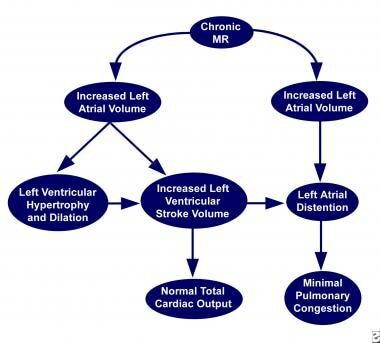 The LV compensates via the Frank-Starling mechanism, resulting in a greater ventricular stroke volume. The volume of the regurgitant fraction depends on several factors, including the size of the orifice allowing regurgitation and the pressure gradient between the LV and left atrium. This volume also depends on the ventricular systolic pressure; therefore, the regurgitant volume increases in situations that increase afterload, such as hypertension or aortic stenosis. The natural history and time course of mitral regurgitation varies, but mitral regurgitation can develop in three distinct stages (ie, acute, chronic compensated, chronic decompensated) that are clinically significant. The stages depend on acuity of onset, regurgitant volume, and compliance of the left atrium. Acute mitral regurgitation causes sudden volume overload of the left atrium and LV. Initially, the undilated left atrium restricts the regurgitant volume at the expense of increase in both left atrial and LV end-diastolic pressures. Although total ventricular stroke volume increases compared to normal, total forward stroke volume usually decreases, thereby lowering cardiac output. In the acute situation, rapidly increasing left atrial pressure results in elevated pulmonary venous pressure causing pulmonary congestion and, eventually, pulmonary edema (see the image below). 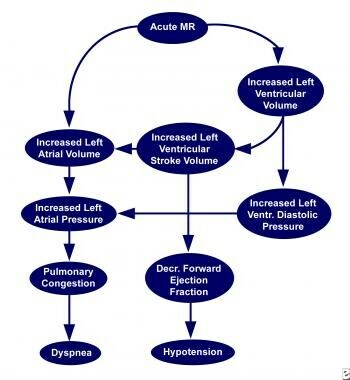 Acute stage of mitral regurgitation (MR) (mitral valve insufficiency). In the chronic compensated stage, the LV compensates by allowing greater diastolic filling and developing LV enlargement to augment forward stroke volume. More importantly, the left atrium dilates in response to the increased volume. Compensation for the increased volume can occur without resulting in increased pressure in the pulmonary circulation and the right heart. Left atrial compliance decreases the afterload on the LV, whereas LV dilatation and hypertrophy increases contractility. These important changes keep the overall afterload on the left heart normal or unchanged. Although the regurgitant fraction may be high, the larger stroke volume compensates, maintaining a nearly normal forward cardiac output (see the image below). Chronic compensated stage of mitral regurgitation (MR) (mitral valve insufficiency). The chronic decompensated stage occurs when the LV is unable to sustain adequate forward cardiac output. As LV contractility begins to decrease, end-systolic volume gradually increases, thereby increasing LV end-diastolic pressure. The resulting increased pressure in the left atrium creates increased afterload, which further impairs LV ejection, thereby creating a repeating cycle. Whereas the end-diastolic and end-systolic volumes increase, pulmonary congestion eventually results if the cause of the mitral regurgitation is left untreated. Although the forward LV ejection fraction is reduced compared to the compensated phase, the overall ejection fraction could remain normal because of a large regurgitant flow. As the degree of mitral regurgitation worsens, the total ejection fraction falls, indicating increasing ventricular dysfunction. 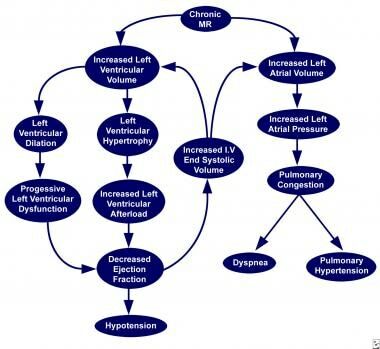 Pulmonary hypertension may develop under long-standing increased pulmonary venous pressure, and, ultimately, it can lead to right heart failure (see the image below). Chronic decompensated stage of mitral regurgitation (MR) (mitral valve insufficiency). In patients with mechanical prostheses, administration of too much warfarin may result in excessive bleeding, whereas insufficient anticoagulation may lead to thromboembolism. Asymptomatic children with mitral regurgitation (MR) (mitral valve insufficiency) require regular examinations because the indolent course of mitral regurgitation may be deceptive as long as the heart is able to compensate for the altered hemodynamics. Patients and families require education regarding specific medications, especially warfarin. Ahmed MI, McGiffin DC, O'Rourke RA, Dell'Italia LJ. Mitral regurgitation. Curr Probl Cardiol. 2009 Mar. 34(3):93-136. [Medline]. Rahimtoola SH. The mitral valve is a complex structure. Foreword. Curr Probl Cardiol. 2009 Mar. 34(3):89. [Medline]. Zhang L, Qiu J, Yu L, Chen S, Sun K, Yao L. Quantitative assessment of mitral apparatus geometry using dual-source computed tomography in mitral regurgitation. Int Heart J. 2015. 56(4):408-14. [Medline]. Kalfa D, Vergnat M, Ly M, et al. A standardized repair-oriented strategy for mitral insufficiency in infants and children: midterm functional outcomes and predictors of adverse events. J Thorac Cardiovasc Surg. 2014 Oct. 148(4):1459-66. [Medline]. Park SM, Park SW, Casaclang-Verzosa G, et al. Diastolic dysfunction and left atrial enlargement as contributing factors to functional mitral regurgitation in dilated cardiomyopathy: data from the Acorn trial. Am Heart J. 2009 Apr. 157(4):762.e3-10. [Medline]. Pederzolli N, Agostini F, Fiorani V, et al. Postendocarditis mitral valve aneurysm. J Cardiovasc Med (Hagerstown). 2009 Mar. 10(3):259-60. [Medline]. Carpentier A. Congenital malformations of the mitral valve. Stark J, de Laval M, eds. Surgery for Congenital Heart Defects. WB Saunders Co; 1983. 467-82. Arunamata A, Selamet Tierney ES, Tacy TA, Punn R. Echocardiographic measures associated with early postsurgical myocardial dysfunction in pediatric patients with mitral valve regurgitation. J Am Soc Echocardiogr. 2015 Mar. 28(3):284-93. [Medline]. Little SH, Pirat B, Kumar R, et al. Three-dimensional color Doppler echocardiography for direct measurement of vena contracta area in mitral regurgitation: in vitro validation and clinical experience. JACC Cardiovasc Imaging. 2008 Nov. 1(6):695-704. [Medline]. Calafiore AM, Gallina S, Iaco AL, et al. Mitral valve surgery for functional mitral regurgitation: should moderate-or-more tricuspid regurgitation be treated? a propensity score analysis. Ann Thorac Surg. 2009 Mar. 87(3):698-703. [Medline]. Malaspinas I, Petak F, Chok L, et al. Surgical repair of mitral valve disease in children: perioperative changes in respiratory function. J Cardiothorac Vasc Anesth. 2016 Oct. 30(5):1286-95. [Medline]. Kumar AS. Surgical options in rheumatic mitral valve disease in children: a surgeon's perspective. World J Pediatr Congenit Heart Surg. 2014 Jan 1. 5(1):80-4. [Medline]. Cardoso B, Loureiro P, Gomes I, et al. Mitral valve surgery for rheumatic lesions in young patients. World J Pediatr Congenit Heart Surg. 2016 May. 7(3):321-8. [Medline]. Vida VL, Zanotto L, Carrozzini M, Padalino MA, Stellin G. Repair techniques for mitral valve insufficiency in children. Semin Thorac Cardiovasc Surg Pediatr Card Surg Annu. 2018 Mar. 21:41-5. [Medline]. Delmo Walter EM, Komoda T, Siniawski H, Hetzer R. Surgical reconstruction techniques for mitral valve insufficiency from lesions with restricted leaflet motion in infants and children. J Thorac Cardiovasc Surg. 2012 Apr. 143(4 Suppl):S48-53. [Medline]. Wan CK, Suri RM, Li Z, et al. Management of moderate functional mitral regurgitation at the time of aortic valve replacement: is concomitant mitral valve repair necessary?. J Thorac Cardiovasc Surg. 2009 Mar. 137(3):635-640.e1. [Medline]. Rao PS, Solymar L, Fawzy ME, Guinn G. Reassessment of usefulness of porcine heterografts in mitral position in children. Pediatr Cardiol. 1991 Jul. 12(3):164-9. [Medline]. Bernal JM, Gutierrez F, Farinas MC, et al. Use of mitral homograft to support a mechanical valve prosthesis: a feasible solution for recurrent mitral valve dysfunction. J Thorac Cardiovasc Surg. 2009 Mar. 137(3):762-3. [Medline]. Block PC. Percutaneous mitral valve repair for mitral regurgitation. J Interv Cardiol. 2003 Feb. 16(1):93-6. [Medline]. Wong MC, Clark DJ, Horrigan MC, Grube E, Matalanis G, Farouque HM. Advances in percutaneous treatment for adult valvular heart disease. Intern Med J. 2009 Jul. 39(7):465-74. [Medline]. Silvestry FE, Rodriguez LL, Herrmann HC, et al. Echocardiographic guidance and assessment of percutaneous repair for mitral regurgitation with the Evalve MitraClip: lessons learned from EVEREST I. J Am Soc Echocardiogr. 2007 Oct. 20(10):1131-40. [Medline]. Feldman T, Kar S, Rinaldi M, et al, for the EVEREST Investigators. Percutaneous mitral repair with the MitraClip system: safety and midterm durability in the initial EVEREST (Endovascular Valve Edge-to-Edge REpair Study) cohort. J Am Coll Cardiol. 2009 Aug 18. 54(8):686-94. [Medline]. Anderson RH, Wilcox BR. The anatomy of the mitral valve. Wells FC, Shapiro LM, eds. in Mitral Valve Disease. 2nd ed. Oxford: Butterworth-Heinemann; 1996. 4-13. Barlow JB. Mitral regurgitation. Perspectives on the Mitral Valve. FA Davis Co; 1987. 113-31. Carabello BA. Mitral valve regurgitation. Curr Probl Cardiol. 1998 Apr. 23(4):202-41. [Medline]. Dunn JM. Porcine valve durability in children. Ann Thorac Surg. 1981 Oct. 32(4):357-68. [Medline]. Eckberg DL, Gault JH, Bouchard RL, et al. Mechanics of left ventricular contraction in chronic severe mitral regurgitation. Circulation. 1973 Jun. 47(6):1252-9. [Medline]. Enriquez-Sarano M, Avierinos JF, Messika-Zeitoun D, et al. Quantitative determinants of the outcome of asymptomatic mitral regurgitation. N Engl J Med. 2005 Mar 3. 352(9):875-83. [Medline]. Kolibash AJ Jr, Kilman JW, Bush CA, et al. Evidence for progression from mild to severe mitral regurgitation in mitral valve prolapse. Am J Cardiol. 1986 Oct 1. 58(9):762-7. [Medline]. Kon MW, Myerson SG, Moat NE, Pennell DJ. Quantification of regurgitant fraction in mitral regurgitation by cardiovascular magnetic resonance: comparison of techniques. J Heart Valve Dis. 2004 Jul. 13(4):600-7. [Medline]. Krivokapich J. Echocardiography in valvular heart disease. Curr Opin Cardiol. 1994 Mar. 9(2):158-63. [Medline]. Magovern JH, Moore GW, Hutchins GM. Development of the atrioventricular valve region in the human embryo. Anat Rec. 1986 Jun. 215(2):167-81. [Medline]. Perloff JK, Roberts WC. The mitral apparatus. Functional anatomy of mitral regurgitation. Circulation. 1972 Aug. 46(2):227-39. [Medline]. Shimoyama H, Sabbah HN, Rosman H, et al. Effects of long-term therapy with enalapril on severity of functional mitral regurgitation in dogs with moderate heart failure. J Am Coll Cardiol. 1995 Mar 1. 25(3):768-72. [Medline]. Skoularigis J, Sinovich V, Joubert G, Sareli P. Evaluation of the long-term results of mitral valve repair in 254 young patients with rheumatic mitral regurgitation. Circulation. 1994 Nov. 90(5 Pt 2):II167-74. [Medline]. Tribouilloy C, Shen WF, Leborgne L, et al. Comparative value of Doppler echocardiography and cardiac catheterization for management decision-making in patients with left-sided valvular regurgitation. Eur Heart J. 1996 Feb. 17(2):272-80. [Medline]. Dilated cardiomyopathy with significant mitral regurgitation (MR) (mitral valve insufficiency) by transthoracic echocardiogram (A) and cardiac magnetic resonance imaging (B). Cleft mitral valve seen in parasternal short axis view (A) with mild mitral regurgitation (MR) (mitral valve insufficiency) in 4-chamber apical view (B). Analyze This Image: Diastolic Signal -- Systolic Diagnosis?